Sally Bassett spent a number of years teaching in primary and secondary schools before taking an honours degree in Fine Art. The essence of Sally's work is its energy, vitality and colour. Her art work begins with observational drawings and notes collected in a small sketchbook. She may use charcoal on paper, acrylic paint on canvas or board, collage on paper, or silk dye on silk. 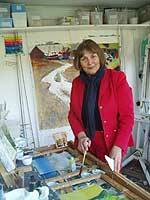 Sally spends many hours a week out in the countryside of Hertfordshire and the Chilterns or by the sea at her studio on Cornwall, all the year round and in all weathers. Her need to be outdoors and love of nature in the raw underlies most of her paintings, and is the key to why so much of her work conveys the special atmosphere, energy and light of a single moment. Sally says, "I think my most successful pieces evolve when I have been able to distil the power, colour, atmosphere and essence of a place or subject and to communicate the excitement I feel in a three-way dialogue between myself as the artist, the work itself and and the person looking at it." Sally welcomes vistors to her studio to view her paintings. Please telephone 01442 851353 or email Sally at sally@sallybassett.co.uk to arrange an appointment.